The Stockton Police Department has been regularly posting mugshots since it started its Facebook page in March 2012, but none of them have garnered as much attention as Stockton's Facebook mugshot of Jeremy Meeks. That's because Meeks, with his high cheekbones, chiseled jawline, and baby-blue eyes, looks like he stepped out of a Tommy Hilfiger ad. Since it was posted on Wednesday, the picture has amassed nearly 54,000 likes, over 6,000 shares, and nearly 16,000 comments. While it's always good for citizens to keep an eye on crime, we're pretty sure Meeks's arrest charges are the last thing on their minds. According to its Facebook caption, the Stockton Police Department recently conducted the multi-agency Operation Ceasefire after noticing increased gun violence and robberies in the Weston Ranch area. The investigation identified a new active group allegedly responsible for the violence, including Meeks and three other men who were also arrested, and whose mug shots were also posted on the department's Facebook page. In the caption, each man's age and charges are listed. 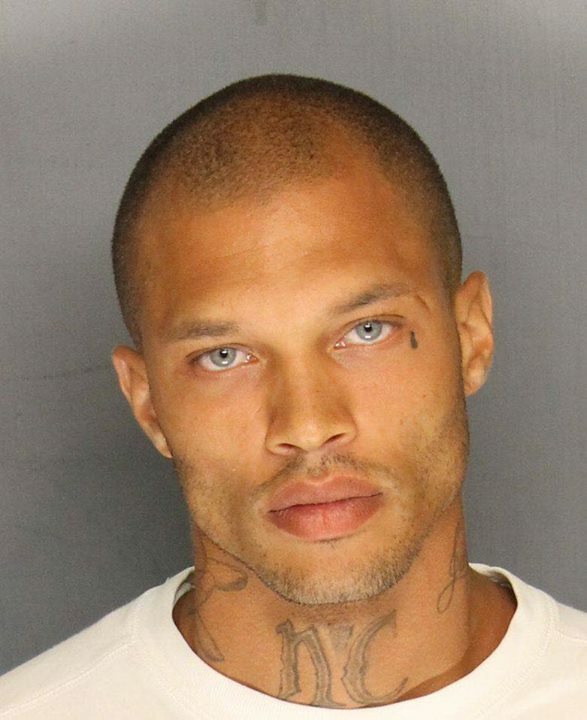 Jeremy Meeks, a 30-year-old man, convicted felon, arrested for felony weapon charges. Terry Bailey, a 22-year-old man, convicted felon, arrested for felony weapon charges. Juzri Coleman, an 18-year-old man, arrested for felony weapon charges. Joelin Coleman, a 44-year-old man, arrested for felony weapon charges. Officer Joseph Silva, a spokesperson for the SPD, told the Associated Press that Meeks was "one of the most violent criminals in the Stockton area." He didn't identify what those violent crimes were, and Meeks' family have insisted that Meeks is a former gang member who carries a gun in his trunk only to protect himself. According to a fundraiser for Meeks' $900,000 bail set up by his family, he's a Christian "working man with a son. He is being stereotyped due to old tattoos." Some women were able to resist his baby blues and keep things in perspective. And then there were the men, who not only maintained the larger picture but took the opportunity to call the women out on their absurd comments and hypocrisy. And as if all the attention on Facebook weren't enough, Meeks has officially become a meme, accompanied by the hashtag #FreeJeremyMeeks. These mock fashion ads are quite hilarious and entertaining, yeah. And anyone who's unfamiliar with the situation would think that they were real. So what has this guy been thinking? Didn't anyone in his life ever take him aside and say, "Hey, man, have you ever, like, looked in the mirror? Give me that AK and go to a Manhattan modeling agency." Except he didn't. Meeks has served time before and is a convicted felon, whom, according to Silva, was arrested on Wednesday on five weapons charges and one gang charge. In light of these charges, the hashtag #FreeJeremyMeeks, which is basically suggesting a criminal should be let off the hook for being hot, may be a bit much. How about a #FairTrialForJeremyMeeks hashtag instead? Or a #JeremyMeeksTVMovie hashtag? Come on, people.